Guitarists and most instrumentalists in general, think hands when they consider their playing ability. This is as wrong a conception as if we thought wheels when thinking of an automobile's ability to move. The hand contains 27 bones, the largest number of bones for a single part of the human body. When the guitarist looks beyond the hand, he discovers that a whole group of bones, muscles, tendons and nerves are the real mechanisms responsible for the correct working of the fingers, which ought to be seen as the final part of the playing apparatus. The fingers do the fine work but it is the wrist, forearm elbow and shoulder that allow for the heavy work and, ultimately, the correct functioning of the fingers. 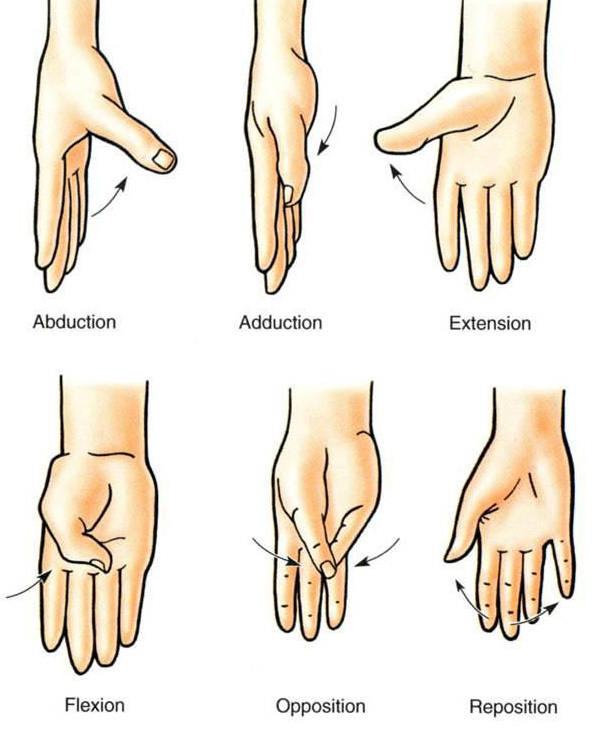 The forearm is the the place where the main muscles and tendons responsible for the fingers' contraction-extension ability are located. 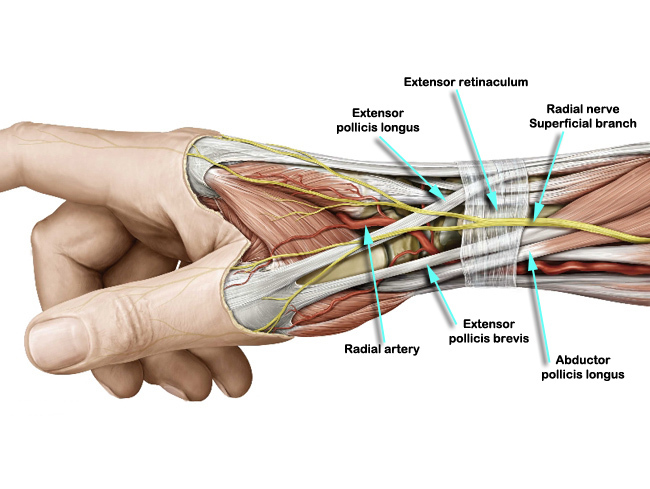 The tendons and blood vessels pass to the hand through a bracelet kind of belt that is located in the wrist area. Close observation of these images tells us a lot more about our hands than a thousand words can try to describe. One thing is certain, applying too much stress for too long and in the wrong manner, will certainly drain out the energy from these minute and delicate parts. 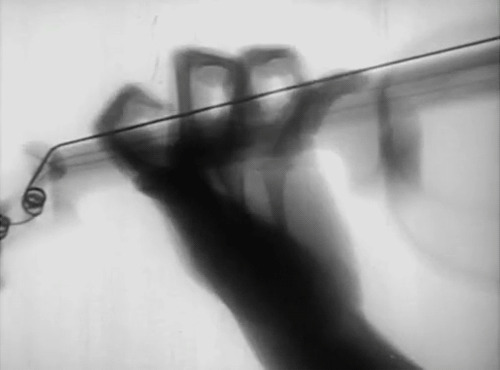 We must allow for the stronger muscles in the arm to help the left hand fingers find their position on the strings. 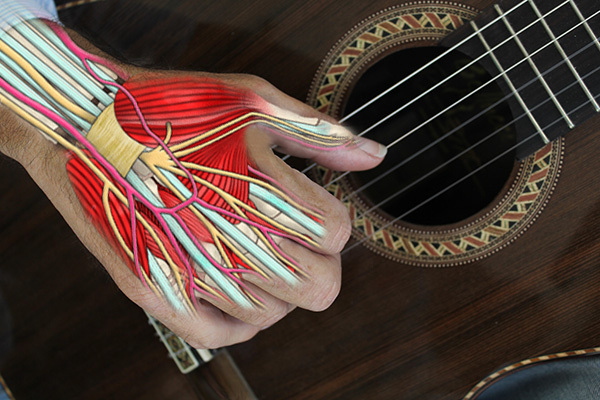 This complex system of bones in the wrist area must be used extensively by the guitarist with the cooperation of the arm and shoulder to guide and "present" the left hand fingers on the strings. The nervous system is the equivalent of the electrical wiring in a home. 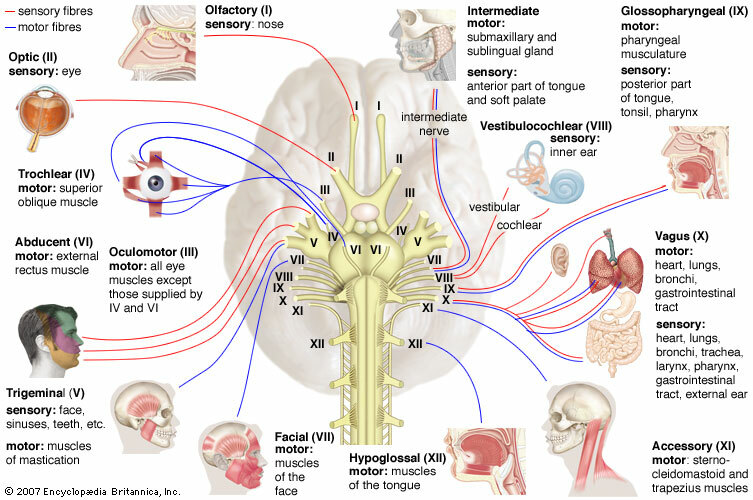 It sends the electrical impulses to the muscles directly from the brain. That in itself is a pretty good reason to why we must think of every finger movement when we attempt to build out guitar technique during the study process. No movement should be left to chance in this stage of musical preparation. Letting go and let the miracle happen is for performance. The spinal cord is the main highway for the distribution of all the impulses coming from the base of the brain, and that is the reason that we must find a sitting position that applies very little stress to the lumbar area which is the place where the spinal chord ends. Tension in this area is passed by "the highway" to the whole motor system. Sound from a guitar starts when a players fingers set a string in motion. The body of the guitar helps the air vibrate at a certain pitch and make it louder -amplification process-. Sound is actually air that vibrates, or changes pressure very quickly (20 to 20,000 times a second), and travels as a sound wave. 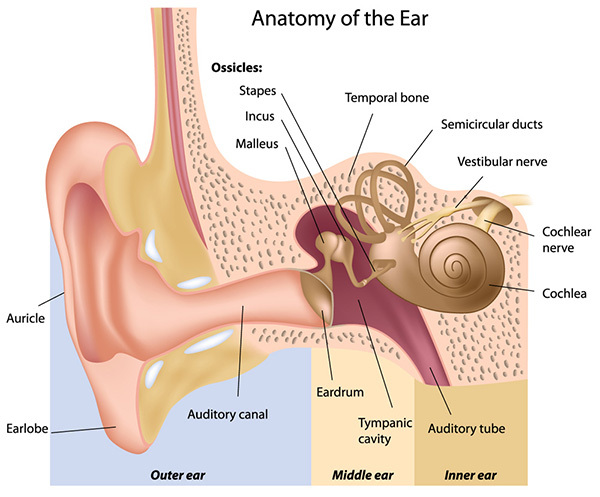 The outer ear (Pinna) catches the sound wave and directs it into the inner ear, where the ear drum (Tympanic Membrane) is. The ear drum vibrates the Ossicles (three bones called the Hammer, Anvil, and Stirrup). They act as a lever which push against the Vestibule and moves the fluid inside to the Cochlea. The tiny hairs in the cochlea turn this pressure into electrical signals, which is then sent to the brain, using the cochlear nerve. The brain accepts the electrical signals and recognizes that it is a guitar.